the only other small clutch-like bags i've liked are the stella mccartney and natalia brilli miniaudieres i posted about a while back...however, imagine my surprise when i spotted kate lanphear's vintage bag below hanging in the window of a random junk store in long beach. best $10 ever spent! I'm crazy about those bags! I really really want the McQueen one. GAH! those 2 are amazing! i also saw one of those little clutches that kate is wearing at an antique store. however, it was brownish red. and i ain't a brown kinda girl. had it been black, i woulda been all over it. yes i love that clutch and the little vintage bag you purchased as well. The clutch in the 2nd pic is too rad! I generally don't like clutches because you have to hold on to them without a strap all the time. Looks like McQueen has saved the day! Kate's small bag is actually Proenza Schouler. LOL I love that Mcqueen clutch! You can look glamorous and take someone out with it too. 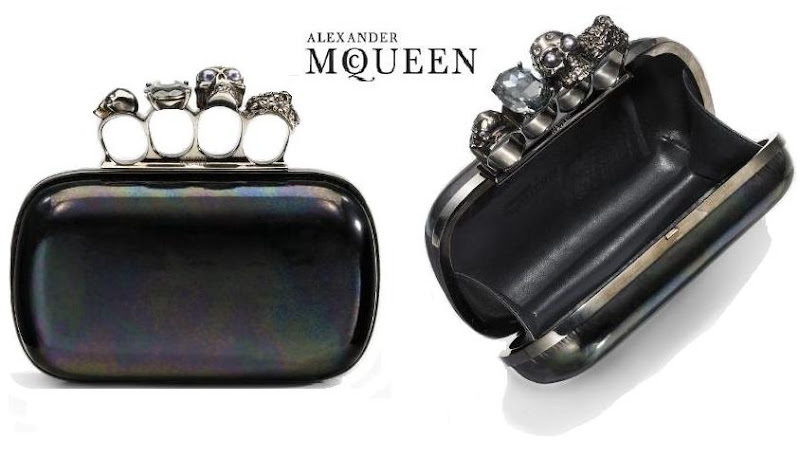 i need that mcqueen clutch in my life. reminds me of a few knuckle dusters i was planning on saving for. this is inspiring me to just purchase a plain old box clutch from zara and hot weld some rings on the opening. if only i had the time and patience. Grange Hall in Dallas has the best Natalia Brilli Bags and Accessories.